The genus has about a hundred recognized species (The World Monocot Checklist recognizes 64 species and numerous natural hybrids) of which fewer than twenty have been used in horticulture. It is very unlikely that any discoveries of showy new species will occur in the future. 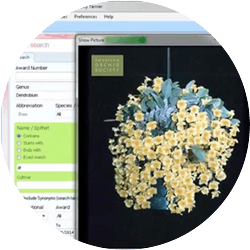 Close affinity is recognized with Grammatophyllum and successful intergeneric hybrids have been made. The name derives from the Greek ktmbes, boat shaped, an allusion to the shape of the lip. Modern Cymbidium hybrids trace back to less than ten species, mostly growing in the higher elevations of the mountainous backbone of Asia and supplemented more recently by the influence of the miniaturizing species C. pumilum (syn. C floribundum) and the heat-tolerant species C. ensifolium. Some hobbyists enjoy cultivating the species of China and Japan and these will be discussed separately. Cymbidiums are not particularly prone to many pests. Red spider is always a concern and is a sign that the plants are in too hot an environment, with too little humidity. 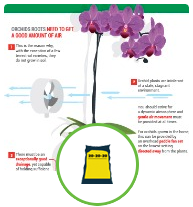 Often, just changing your growing conditions will eliminate the problem and if not, a good spraying with any paraffinic oil like Ultra-Fine on a regular basis (once every three weeks) will keep plants squeaky clean. Be careful that aphids don’t attack your buds as they emerge from the flower sheath. 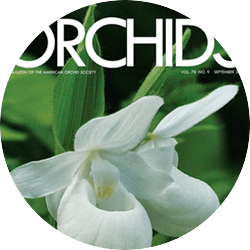 The two common orchid viruses are a problem in Cymbidiums so make sure you practice hygienic growing and also be wary of introducing plants from suspect sources. One of the advantages with Cymbidiums is that the common viruses produce visible leaf symptoms so the infected plants can be isolated, checked and eliminated easily. Oriental species are renowned for their fragrance and subtle charm Often they are grown in decorative deep pots as their root systems tend to grow down rather than branch. Most are terrestrial in their native habitat as well as semi-dormant over winter so they can take dry and cool temperatures at this time. Media can be quite complicated but we find they will also grow easily in traditional Cymbidium mixes to which a bit more perlite or some small pebbles are added. 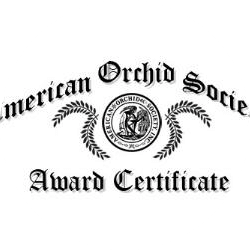 If you want to learn more about cymbidiums, join the Cymbidium Society of America, an AOS affiliated specialty group. Temperature: 1) Large flowered species from China and the Himalayas require a pronounced period of cool weather during the late summer and early fall such as coastal California to initiate flower spiking, maximum night temperatures of 53°F (12C). 2) Small flowered terrestrial species from the Himalayas, China and Japan do not require a substantial chilling period to bloom. These do well in cool to intermediate temperatures year round. 3) The small flowered tropical species require no chilling period and prefer to be warm year round. Light: Anything having ancestors from the higher elevations will need high light intensities to grow and more importantly, flower freely. Cymbidiums are quite happy with between 5000-6,000 ft. candles (about 50% shade) of noon light and can take direct sun either in the early am or late pm. However, they do not enjoy full sun all day except maybe in coastal areas of California. As flower colors fade in this light it is quite acceptable to add extra shade over actual blooming plants or take them indoors when blooming for a month or so and enjoy the blooms. Most failures with re-blooming Cymbidiums can be traced to inadequate light. 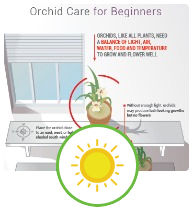 Water-Humidity: Watering and fertilizing: Cymbidiums enjoy copious water during their summer growth but also have substantial pseudobulbs to store moisture so don’t suffer if left up to 10-12 days between waterings in the depth of winter, especially in higher latitude regions. Always water well, making sure the pot is fully saturated and then let dry out before the next watering. 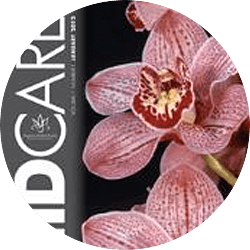 Fertilizer: Cymbidiums are heavy feeders in their growth periods and much less over winter. Some hobbyists achieve very good results by using slow release fertilizers like Nutricote as topdressing twice a year. This product is sold under various trade names like “Dyn-O-Mite” in one-pound containers. The 13-13-13 formulation that is good for 180 days is very satisfactory. Apply it twice a year in early spring and again six months later. It is recommended to apply a heaped teaspoon per 6-inch pot in spring and a level teaspoon in fall with more or less for bigger or smaller plants. If you prefer to liquid feed, use 20-20-20 year round, at recommended strength in summer and fall and at 1/3 recommended rate over winter into spring. 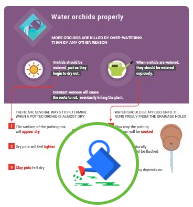 Many growers topdress their plants with a heaped teaspoon of Epsom salts (MgSO4) in June and again in mid-August in the northern hemisphere. Potting: Cymbidiums are semi-epiphytic so enjoy any growing medium that is free draining. Many growers use a mixture of coconut chip, bark and perlite that is supplemented with dolomitic lime to bring up the pH. Dividing and repotting should always follow flowering but not until the new shoots are about 5-6 inches long. Potting up to a larger size pot when the rootball is in good condition can be done at any season except winter. 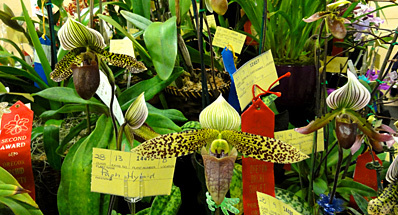 The large flowered species are usually grown in large pots or tubs; the small flowered terrestrial types bear upright inflorescences and are best grown in pots; the small flowered tropical cymbidiums mostly produce pendent inflorescences and should be grown in hanging baskets or pots. References: Bechtel, Cribb, Launert, The Manual of Cultivated Orchid Species, 3rd edition, MIT Press, 1992. Hawkes, Alex, Encyclopaedia of Cultivated Orchids, Faber & Faber, London and Boston, 1965. Pridgeon, Alec, The Illustrated Encyclopedia of Orchids,Timber Press, Portland, OR, 1992.